With the Democratic National Convention approaching, it has now been confirmed that Hillary Clinton is the Democratic Party nominee in the 2016 Presidential election. While SDS’s focus is primarily on building organizational power within our communities and carrying out direct action, this result is not irrelevant to us. Multiple chapters from SDS will be marching on the DNC along with many other organizations to protest the racist, warmongering platform of the Democratic Party. Despite her rhetoric, Hillary Clinton ultimately represents the interests of the Wall Street billionaires and the rest of the 1%. As the perfect ‘status quo’ candidate, Clinton carries out a neoliberal agenda, having a history of racist, warmongering, anti­-immigrant, and anti­-worker pursuits and policies. 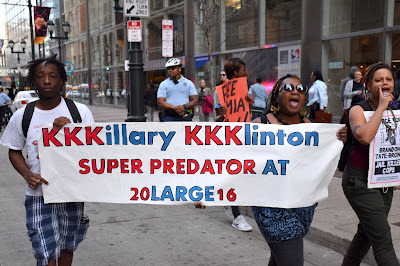 Domestically, Clinton is notorious for “superpredator” bills contributing to mass incarceration, mass deportations, austerity, spending cuts, and the continued support of big business. Abroad, Clinton promotes war over peace, and has been involved in NATO­led wars against Libya, Afghanistan, Iraq, and Syria, as well as coups in Honduras and Ukraine. Hillary Clinton’s record and platform, on par with the policies of both major parties, contribute to the continued attack on all workers and oppressed people. Clinton secured her nomination by outperforming Bernie Sanders, a candidate who is less of a ‘major player’ in the Democratic Party, but who was able to find a base of support in the youth. The Bernie Sanders campaign, despite his widespread popularity, demonstrates the need to continue as independent organizers. Ultimately, Bernie Sanders could not win the nomination because the interests which control the Democratic Party supported the Clinton campaign. As an organization that supports education rights, economic freedom, social justice, and many other causes that were important to the Sanders campaign, we invite those who wish to continue the struggle to join in political organizing to build people’s power. While SDS has put out the call to “Dump Trump”, we are not letting the Democratic Party slide either. The neoliberal agenda pursued by the Democrats and Republicans alike is responsible for the economic crises, police brutality, mass deportations, and mass incarceration that have allowed for the rise of a racist, sexist, anti-­immigrant demagogue like Donald Trump. While the Donald Trump campaign is a more openly and acutely racist, anti­-immigrant, fear mongering platform, ultimately the interests of the people are not represented by either party. In fact many of the fears about a potential Trump presidency are already being actively carried out by the current Obama administration, including the deportation of more than 2.5 million immigrants, drone strikes in 7 different countries, anti­-worker austerity measures, and mass incarceration. Ultimately, the only way to victory is through building people’s power. This is why National SDS is calling upon progressive students and youth everywhere to carry the momentum from the “Dump Trump” rallies forward into the marches on the Democratic National Convention. To those who are disillusioned, do not let the fight end with the Sanders campaign. Join us at the DNC, and then bring that fight back to your communities and schools, and build organizations of people’s power. Our only path to victory is through working together and building a mass movement independent of the establishment.